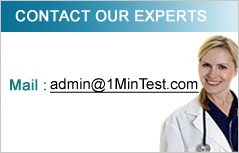 1 Min Test Lab was established in 1999 to help cancer patients with the disease as well as provide the necessary support for their treatments; mentally and physically. We have been successful with treating and counselling patients as well as helping patients to come to terms with their life after cancer. Those that have left us to continue in their lives; have come back and helped us in more ways than we could have. Their support and sincerity is what keeps us growing more and more each day. "Breast Cancer Awareness Drive 2002"
"Cancer It’s effects and causes"
We have since branched off into a niche market in supplying certified HIV Home Test Kits / HIV Antibody Test Kit to Hospitals and Clinics. Even though self-testing is not recommended in UK we still feel that legalising self-testing in the United Kingdom would, reduce the number of undiagnosed HIV infections. It is currently estimated that as many as a third of people with HIV in the UK are unaware that they are infected with the virus. There is evidence from the US suggests that there is a demand for self-testing. Self-testing would also, "enhance patients' choice", providing people with "more say over where, how, and when they would be tested for HIV." We believe that arguments of "patient autonomy" are central to the legalisation of self-testing.